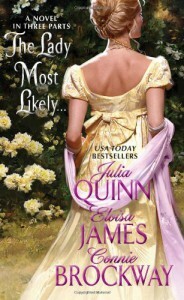 As a fan of Julia Quinn, I could not help but pick up The Lady Most Likely...when I spied it at my library last week. I was in the mood for something short and sweet and this was just that. The story revolves around a house party thrown by Carolyn Finchley as part of her not so subtle quest to find a bride for her brother, The Earl of Briarly. What ensues is a game of romantic roulette where 6 guests find themselves the unexpected prey of Cupid's arrow.I wasnt's sure what to expect in terms of format from a book that had 3 authors. It was not broken up into short stories, as I thought it might be. Instead, it's one continuous story focusing on three separate couples. I actually don't know which author wrote which part. In that sense, I think the story flowed really well. Since the book is about three couples, you only get a short time with each. But even though my time with the characters was short, I found that there was enough substance and character development that I did care about all of them.The circumstances of each romance are quite different. Gwen and Darlington's romance was pretty straight forward and was about that unexpected zing of first love. I thought their story was really cute and Gwen's character was unique because of her painful shyness. Kate and Neill's story had a bit more angst, which I always enjoy. 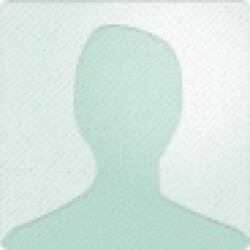 After seemingly rejecting Kate four years ago, Neill returns from fighting Napoleon to find that he must win Kate back. I think their story was my favorite and , out of all the heroines, I liked Kate best. Her straight forward manner and sarcastic wit made her a very fun character. The last story (and I think the longest) was about the Earl of Briarly and Georgie. They are good family friends who realize that they have romantic feelings for one another, which is one of my favorite romance tropes. Their story was really sweet and emotional and it was a nice way to end the book.The Lady Most Likely is a very fun, frothy read. Without a lot of drama or angst, this book isn't the type of sweeping romance that will make you cry. However, I do think it will make you smile. As I said before, I am a huge Julia Quinn fan and would have read this just for her. After reading this though, I would definitely be willing to read something else by both Eloisa James and Connie Brockway. Fans of historical romance looking for a light, entertaining read will enjoy this one.